Define educator for America’s schools. It’s critical to nail this down during a teacher shortage and when there are attempts to privatize public schools. We don’t want people with inappropriate or no credentials teaching America’s children and directing their public schools. Ensuring that teachers and administrators are qualified used to be required. Since NCLB, alternative routes to teaching and educational leadership have blurred the lines and deregulated the profession. Tampering with education credentials lessens their importance. This is a trick of those who want school privatization. It’s no accident that there’s a teacher shortage at the same time teaching requirements have weakened. With a worsening problem to keep teachers in the classroom, some states relax teaching requirements! If teacher preparation continues to be diminished by ill-defined teacher preparation and credentialing programs, children will get teachers who don’t understand what they teach, or how children learn. For example, recent reports referred to Beta O’Rourke’s wife, Amy, as an educator. Mrs. O’Rourke taught kindergarten in Guatemala, but she has a degree in psychology. She is not an educator. It isn’t clear what kind of credentials O’Rourke needed to teach in Guatemala, or what progress the children made under her instruction. When she returned to El Paso in 2004, she worked with Centro de Salud Familiar La Fe a health clinic, and helped create a K-8 charter school focused on dual-language. She became superintendent of the school without any educational administrative credentials. According to Deutsch29, O’Rourke’s school dropped two grade levels. Now she is the “Choose to Excel” director at CREEED a foundation designed to raise money for charter schools. She is still not an educator. This is an insult to career teachers as Associate Professor Mitchell Robinson describes here. When one spends time and money studying their subject and playing by the rules to become an educator, it is difficult to hear anyone without an education degree steal the title. Amy O’Rourke is not alone. Look at any nonprofit that is about school privatization. Staff will call themselves educators even though they have degrees in everything from political science to law. The problem isn’t only with teachers. In state education departments and local school districts, we have a glut of administrators in key positions who have minimal education training, usually little experience working with children, who determine school policy. These individuals are groomed to privatize public schools. Betsy DeVos is a good example. Arne Duncan was another. Neither had experience working with children or university education degrees. Duncan had been superintendent of Chicago’s public schools, but he was just as unqualified for that position. Both have been all about increasing charter schools and creating a privatized educational system. Public schools used to be stricter about who could teach and run schools. Elementary teachers had backgrounds in how to teach subjects like social studies and science, and present meaningful activities for children that age. They were prepared to teach reading. Middle and high school teachers understood a chosen subject, had ample number of courses in what they would teach and coursework on how to teach their subject to students. Art and music teachers required a background in the arts and how to teach the arts. Special education teachers had to know their specialty. Teachers working with children with deafness required special preparation and certification. The same for learning disabilities, autism, developmental disabilities, and students with emotional difficulties. Those in educational administration were once teachers who added university coursework in leadership. Principals I knew used to strictly enforce teaching requirements. You could not teach outside your certification area unless there was an emergency. Now, I have heard of Teach for America novices running special education classrooms. This, of course, happens more in poor schools. Here’s how teaching credentials have changed to push privatization. Charter Schools. Many charter teachers come from Teach for America. It’s not clear how charter school teachers are prepared. Some charter schools are permitted to train their own teachers. What kind of accreditation do they have? Teach for America: This group is well-known for destroying the teaching profession, but they’re aren’t alone. Many nonprofits run fast-track teacher preparation programs to create their brand of educator. The New Teacher Project, Teaching Fellows, Relay Graduate School of Education, New Leaders and many others diminish teacher and administrator qualifications in favor of fast-track teaching and leading. Private and Parochial Schools. These schools don’t usually require state teaching licenses. They might train their own teachers with unaccredited programs. Tax dollars should not flow to these schools when the public doesn’t see how their teachers are prepared. Technology. Replacing teachers with technology and sending children home, or into substandard charter schools without well-prepared teachers is one goal. Most online programs have terrible results but are promoted anyway. Education Schools. While fast track programs pop up, university education schools have signed on to corporate preparation programs like edTPA. Check out Fred Klonsky’s description of this program here. Ed. schools have also partnered with fast track teaching programs like Teach for America, Teaching Fellows, and Relay Graduate School. This diminishes their effectiveness. It’s still important to get a university teaching degree, but recognize that, like K-12, higher education faces privatization pressure. The NACTE and the CAEP. The National Council for Accreditation of Teacher Education (NACTE) merged with the Council for the Accreditation of Educator Preparation (CAEP). They’ve also signed on to the Bill & Melinda Gates Foundation which make them questionable. Online Schools. Many for-profit schools run “get your degree quick” diploma mills. These programs appeal to those who work or find going to college inconvenient, but it is not clear how well they prepare teachers. Even the government has a questionable online program called ABCTE which advertises “Designed to be fast, flexible and affordable, American Board’s teacher certification program is entirely online and self-paced.” The program has a $1900 enrollment fee. Calling anyone an educator, means anyone can be an educator, and then no one is a real educator. It threatens how children learn because we don’t know what someone who calls themselves an educator really knows about what they’re teaching. This concern makes such common sense it’s amazing it needs clarifying. Spread the word. Real teachers do it for a lifetime. Teaching or being a teacher is not something temporary or to be learned fast. My daughter was a natural teacher but she still had to go through a certified program. Not everyone can impart knowledge. Outsourcing services involving schools is troubling. Thank you, Roger, for sharing what’s happening there. It is not much different here. While credentials are important, they are just one reflection of a person’s dedication to the profession. Since I have never studied how to effectively mitigate the educational problems imposed on a person with a reading disability, I should not be the primary instructor who is responsible for these children progressing in reading. That said, some of my career has been spent trying to learn to identify and help people with various perceptual difficulties or processing glitches. This part of my career has been horribly frustrating. Inservice on these matters seems to spend a lot of energy toward the goal of getting me to have empathy for the afflicted, and not very much toward concrete steps that can be taken. Even when there are effective means for addressing these problems, the solution often is impractical due to the time it takes to employ it. So what does this have to do with credentials? Even with education classes (which is what credentials means at a basic level) a person will work their whole career without getting to the point they want to reach. How much more ridiculous is it, therefore, for use to accept the model propounded by the reformers? Their model of training teachers is to just let smart people teach. The ones who want to will stay, the rest will be one and done. I suspect that many of the reformers went to elite private schools where students were so easy to teach that this model worked, at least ostensibly. But it is a failure even there. If you never study how to make a guitar, the one you make will sound like a cardboard box. Children and their learning is infinitely more complex even than a guitar. Thank you for your interesting comment, Roy. 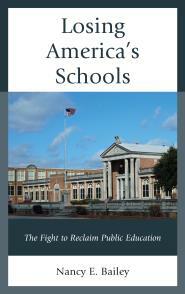 Many believe that alternative teacher programs were meant to destabilize public ed. and teacher education. I’m in that belief camp. Let’s also be clear about “emergency” license. Here in WI that means NO license. It’s a language trick to blunt the fact that your child may have a teacher with NO professional education what so ever. Thank you, Timothy. Wow! But why am I not surprised? Really sad for those students. Another wonderfully incisive examination of a subject that should be of the utmost concern to anyone with a child in the system now. Who should we entrust with the privilege of teaching our children and what should we expect of those who prepare them for the role in return for the privilege? I’ve become increasingly convinced that somehow we have to convey to parents just what it means to let the market determine what works when patently so much of what emerges doesn’t. In no way is this more problematic than when it comes to what these ‘reforms’ mean to real learners, especially the very young. The quality, dedication and skill of teachers has to be underpinned by the quality of training they receive, otherwise our children’s learning suffers. Who is to attend to this? Your remark about teacher shortages is so on the nail. “It’s no accident that there’s a teacher shortage at the same time teaching requirements have weakened.” I wonder how many people, especially parents, understand the connection between the two elements in your statement. If it is believed that transforming the requirements for teaching contributed to the shortage, arising out of burn-out or pressure to discharge the many and varied requirements of teaching, that is one thing. If it is rather imagined that there were shortages of candidates coming forward for training so something drastic had to be done in response, that is quite another interpretation. How that link is understood seems important to me. No scope should be left for those who care less about quality to hide behind the notion that these changes are in response to a genuine need. Thanks, John. I fear there is a disconnect with parents. I’m not sure they demand a credentialed teacher, but assume all teachers have the appropriate credentials. For years this was important in our school districts. I think they assume it still is, but that’s not always the case. Nancy, this brief report landed in my inbox this morning. I’m sure you and your readers will find it very interesting.. I will be sharing it widely with a group of parents campaigning about cuts to education funding here. I will attempt to broaden their understanding of the wider issue of the Global Reform Movement which lies at the heart of the threat to public education. It is vital parents really know that it goes much, much deeper than funding cuts and threats on teacher professionalism, as serious as they are in their own right. Only when it is understood for what it is, can we successfully challenge this movement. It is a serious threat to children’s future. No different here in the U.S. I had an administrator questioning my grouping practices because I didn’t follow the recommendations of the computer generated ones. Seriously?! I was a trained special education teacher tasked with specific legal requirements to design instruction for each student according to their needs. This former biology teacher turned administrator is telling me what I should do based on his snooping in the data generated from the computer portion of my program. I lost my job because I wasn’t teaching this program “with fidelity.” Never mind that the authors of the program didn’t either according to their own descriptions. Never mind that special education law made their demands illegal. Even if I had found it appropriate to follow the program protocols all the time, it would have been impossible since so many of the program elements were not followed/provided by the district. I am sorry you had to experience this. State education departments used to audit local special ed. programs to make sure they were in compliance with the law. I went on such a trip with the Florida DOE years ago, and it involved comprehensive interviews and record reviews. Do they do such monitoring anymore? If they don’t why not? That wasn’t the case with the evaluating state visitation I went on. Teachers did not hold back their concerns. But this was in the 80s. I also had a better experience working with gen. ed. teachers. Collaborating and “mainstreaming” were taken seriously. The teachers I knew sincerely wanted to assist struggling students, and they put time into helping with IEPs despite having pretty large class sizes. I still feel honored to have worked with such a great bunch in both the middle and high school I worked at. I have never been involved in a state evaluation, but I think it would be important not to have administrators present during teacher interviews. My last district in particular would have not been above using a teacher’s critical negative comments against that teacher. Over time I noticed gen ed teachers became more open to the help of special ed teachers, but that was not the case when I went back to teaching in 2002. Collaboration was never easy; I walked a lot of halls trying to track down teachers especially when we had no common planning time. That never happened. Administrators were interviewed separately. But what I did worry about was whether the state did enough to assist the teachers who had complaints. I didn’t see much happen there. Perhaps I wasn’t informed. It was an administrative internship for me, so maybe I wasn’t in the bigger loop. Thanks for sharing your experience. It is interesting to get different perspectives. 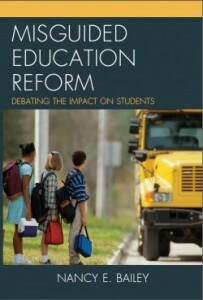 “Ensuring that teachers and administrators are qualified used to be required. Since NCLB, alternative routes to teaching and educational leadership have blurred the lines and deregulated the profession.” — do useless courses about “white privilege” or “male hegemony” instead of teaching how to teach specific subjects have to do anything with looking down on ed schools? Um, this is a toughie. I’m not sure what ed schools you are referring to and what exactly you’re getting at. I have been out of school for a while, but it used to be that they taught subject matter and things like child development and even classes on urban and rural education. I majored in special ed. and later administration and never noticed what you’re claiming. Feel free to elaborate.